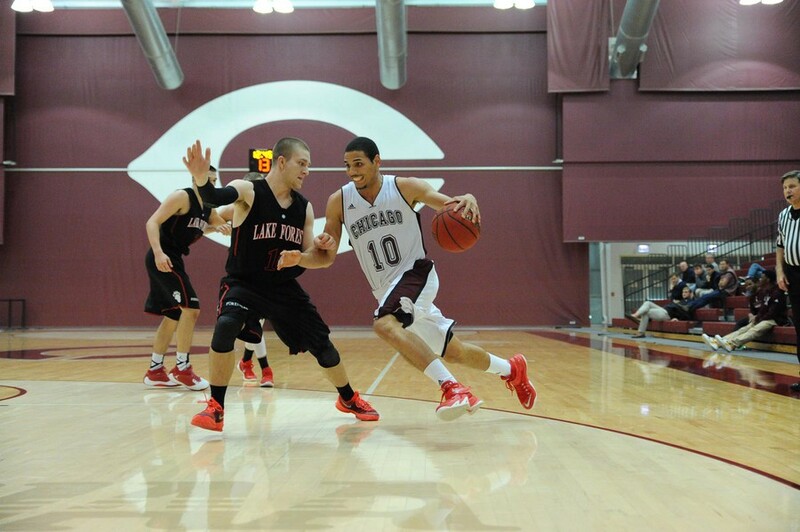 Fourth-year Waller Perez storms past his opponent and towards the basket. On Saturday, the University of Chicago men’s basketball team hosted No. 24 Wash U in its conference opener. The Maroons showed resilience and tenacity to come back from deficits multiple times throughout the game. They fought brilliantly until the final buzzer, but unfortunately fell to the Bears 70–68 in the end on a question- able goaltending call. The game started roughly for the Maroons, as they were trailing 24–12 after 10 minutes, due in part to four baskets by the Bears from behind the arc. However, they answered back with some lights-out shooting of their own by third-years Jake Fenlon and Collin Barthel, and first-year Jordan Baum to take a 36–35 lead into halftime. While the Bears continued to wreak havoc from downtown in the second half, the Maroons always stayed close and took a lead 56–55, thanks to some key points from fourth-year forward Waller Perez. However, this was followed by an 8–0 Bears run to make the score 63–56 in their favor. But, the Maroons were able to cut the deficit to within three with 1:24 left in the game. The team came together behind second-year guard Noah Karras to tie the score 68–68 with 12 seconds left on the clock. However, an untimely goaltending call ended the Maroons’ quest for overtime. Pacing the Bears on offense was fourth-year Clinton Hooks, who led the team with 19 points. Third- year Jake Knupp also contributed 12 points, while his classmate Kev- in Kucera doled out seven assists. Hooks was given the credit for the goal-tended basket. Karras was 45.5 percent from the field and 42.9 percent from behind the arc. He sank three 3-pointers, one of which came with 12 seconds left on the clock to tie the game. “It felt good that the coaches and our team had faith in me to take those shots, and I’m glad I was able to execute,” he said. The team is looking to take that defense to Rochester next weekend, where they will face the undefeated No. 4 Yellowjackets. “Rochester is led by a core group of seniors and they will be a tough matchup, but we believe we match up well against them. A big key will be to play great defense against their guards and try to make them uncomfortable on that end of the floor,” Karras said. Emory is also a solid program, having appeared in the NCAA Tournament the past three years. Although they lost to Rochester this past weekend, they are 9–3 overall and 4–0 at home. Not only will the games this weekend be an opportunity to take down a powerhouse squad, but it will also be a chance for the Maroons to stop a three–game skid. During the three losses, the team hasn’t been able to score more than 70 points, whereas its season average is 83. However, the South Siders seem to enjoy the road, as they are 4–1 when they leave the UChicago campus, while they have just a 4–3 record at home. This bodes well for the first away weekend for the Maroons, as they have added motivation and seem to thrive in those hostile environments. The Friday game will begin at 8 p.m. Eastern in Rochester, NY, while the Sunday game will start at 12 p.m. Eastern Time at the Atlanta home of Emory.